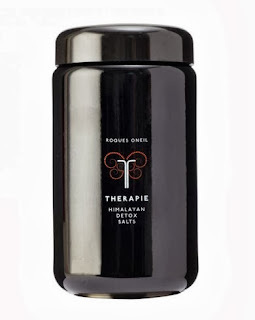 Therapie Roques O'Neil is a brand that was completely new to me before I was contacted by New Zealand stockist Clemency Alice, but one I soon realised that I wanted to know more about. After having a play online, I started to hear so many good things that I knew the range had to be something very special. When my Discover Me mini home spa-type kit arrived from the wonderful Clemency I couldn’t wait to get stuck in, and getting stuck in was what I most certainly did! Called “a natural version of Valium”, these bath salts calm those stress-based palpitations, balance your energy flow and help combat insomnia. A soak in these salts is seriously heavenly, enveloping you with a sense of well being and helping fortify your spirit so you're ready to take on the world again. Their scent alone is enough to send one into paroxysms of ecstasy, and it’s always best to have a quick wash and even exfoliate before you soak. You only need a handful of salts swirled around till dissolved once the bath is filled, and afterwards just lightly brush off any residue (don't wash) and wrap up warm. It’s a good idea to rehydrate afterwards too, then simply bliss out until you drift off! Luckily for you, I have some 100g bags of Therapie Himalayan Detox Salts to give away to ten lucky readers - hurrah! Just email helene@mshelene.com with your name and physical address and you’re in the draw… Competition closes this Friday at 5pm.